Work on the $57.8 million replacement of the picturesque yet potentially precarious Manette Bridge is still roaring along. And lately, construction spectators like yours truly have noticed that the crews of Manson and Mowat are about to turn a corner. As Kitsap Sun reporter Ed Friedrich wrote a few weeks back, construction will soon go from vertical to horizontal. 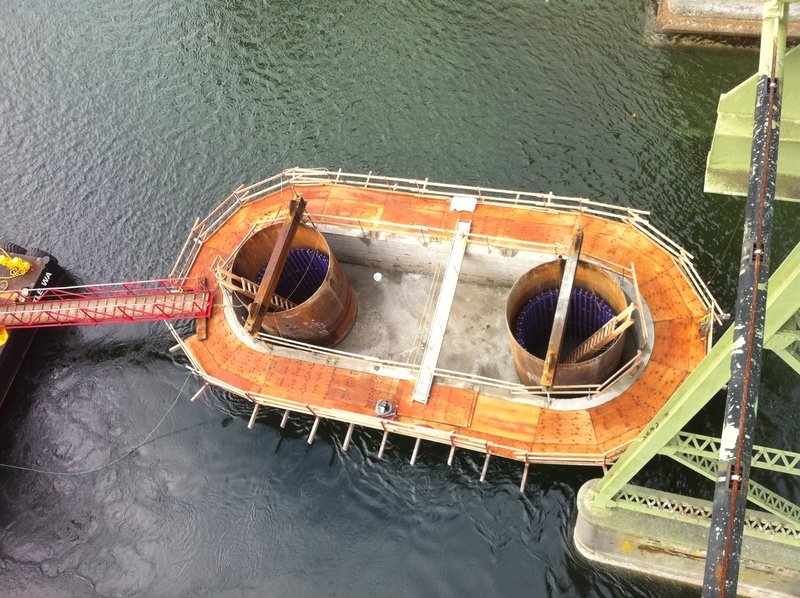 Now that the piers have emerged through construction to form the new bridge’s foundation, barges will be bringing in enormous girders to bridge between the piers. 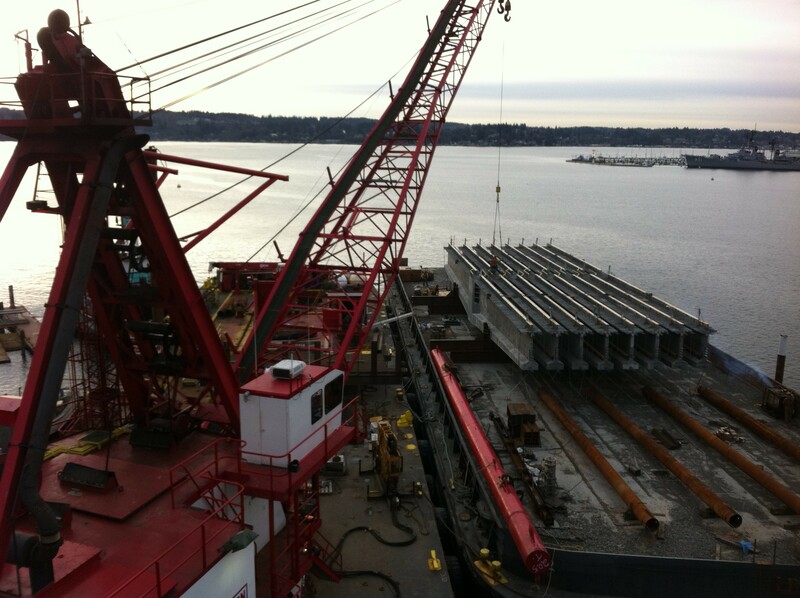 The first of these girders recently arrived (see photo): it’s 123-foot-long and weighs 330,000 pounds, according to the Washington State Department of Transportation. 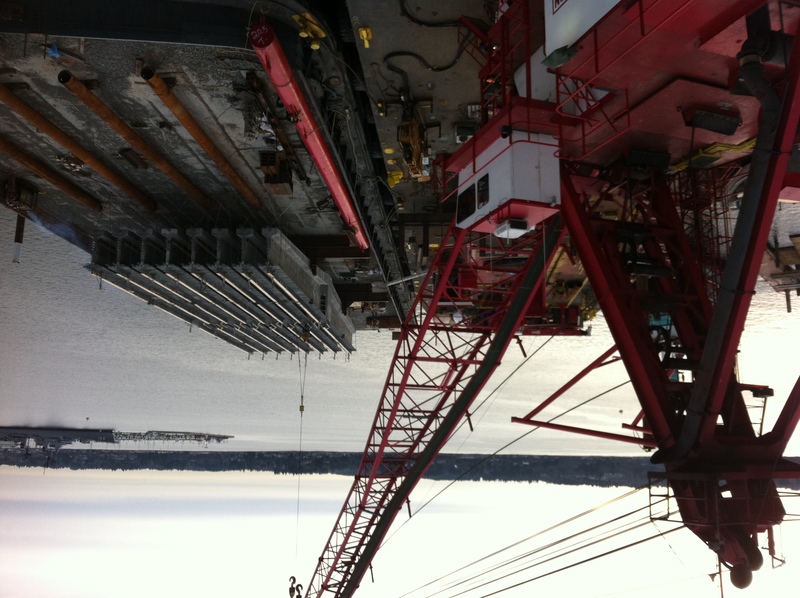 The girder will be placed on Pier 2 — the pier closest to the Bremerton side — sometime this month. We hope to bring you video of crews putting it in place. Moving a sewer line on the Manette side has delayed the project somewhat but crews are working to make up the lost time. It’s hard to believe that by the end of this year, we may in fact be driving on a brand new bridge. Watching the crews from Manson and Mowat build the new Manette Bridge is like a kind of theater. As someone naive yet fascinated by by such a mammoth project, each day brings its share of surprises. What will spring up next? We’re now about two months into the $57.8 million project and the piers are taking shape. The 12-foot wide cylinders are mostly filled with giant purple rebar cages (see photos) and crews are pouring concrete into them. The cylinder is plunged deep into the ground underneath the Port Washington Narrows. On the pier closest to the downtown Bremerton waterfront, a complete concrete base appears to be poured, as you can also see. Most days, spectators frequent the 80-year-old Manette Bridge’s skinny rickety walkway, wide-eyed like me to watch a construction company perform what seems like a Herculean feat. To me, life can be a lot like building a new bridge. Here’s why: When looking at the complete picture, the tasks ahead can seem daunting. But when taking on things one piece on at a time, life’s projects become doable. I was in awe watching the second Tacoma Narrows Bridge go up, and now, those of us in Bremerton get a front row seat to the $57.8 million project to build a new Manette Bridge. If you’ve taken the rickety 80-year-old bridge recently, you know it’s, well, aged. But Washington State Department of Transportation officials say it’s worse than might you think. Using a 100-point scale for “structural sufficiency” (100 being a brand new bridge) they say that bridges with a score of 80 or less demand corrective action. Ones 50 or less are eligible for federal funding. And the Manette Bridge scored a whopping 16.8. So we’re getting a new bridge. I’ll be shooting videos, showcasing the construction by contractor Manson and Mowat, until they get ‘er done in early 2012.